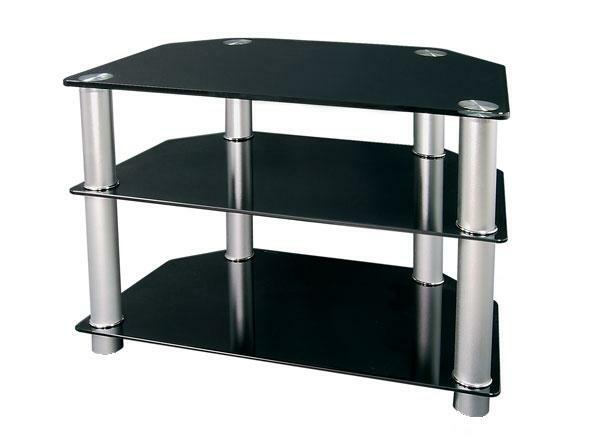 LG ST32B4L TV STAND Up to 32"
ST32B4LM This modern elegant looking support is suitable for any LCD or Plasma screen up to 32 inch. Dimensions: Width: 610.00 mm Height: 580.00 mm Depth: 400.00 mm The TVS ST32B4L is a smaller version of the successful ST42 - with all the style retained! Featuring three tempered glass shelves, the ST32 might be compact but it's well up to the rigours of handling a comprehensive AV system. Contrasting with the high gloss black shelves are matte silver columns. Suitable for TVs up to 32"screen size the TVS ST32 is perfect for combining your TV and sound system. Super stylish. Super practical. The TVS ST32B4L will take a load off your mind!